This entry was posted in News on January 16, 2017 by Darren Winter. 1. Make sure your goods are securely packaged for travelling within the UK and overseas. 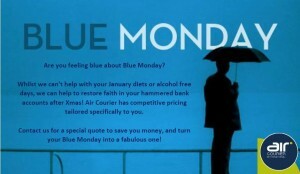 Remember that your shipment will be travelling with thousands of others, some of which may be heavy or bulky. Without proper protection, damage can occur! 2. Always make sure you provide a full name and address, along with contact details like a phone number or email address of the recipient. If the item has value it may incur duty and until we speak to the recipient it will remain in customs (non-EU shipments only). Similarly if we have trouble finding the address or if the recipient is out at the time of delivery, it is helpful to have ontact details available to resolve locally. 3. Be aware that if you are sending gifts to non EU countries, duties may be incurred when they pass through local customs control. Normal procedure is for these duties to be charged to the recipient. If you do not want your recipient to pay the duties, please specify that you wish to pay them at time of booking. This is called DDP (delivery duties paid) or Free Domicile shipping, and means we will bill any duties back to the shipper. 4. Please check prohibited items with our Customer Service department prior to shipping, especially if you are sending alcohol, food or liquids. Every year we have to disappoint someone that tries to send Christmas Crackers overseas. They cannot be sent as courier shipments because they are explosive! 5. 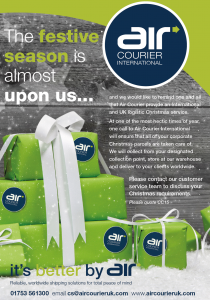 Please allow as much time as possible in the festive period, as all courier companies receive huge spikes in traffic at this time of year. This puts pressure on networks, airlines and customs authorities and can lead to delays. Hopefully these tips will help you make someone’s Christmas and we hope yours is full of hope and happiness too! This entry was posted in News on November 24, 2016 by Darren Winter. This entry was posted in News on November 3, 2016 by Darren Winter. This entry was posted in News on September 7, 2016 by Darren Winter. This entry was posted in News on August 2, 2016 by Darren Winter. 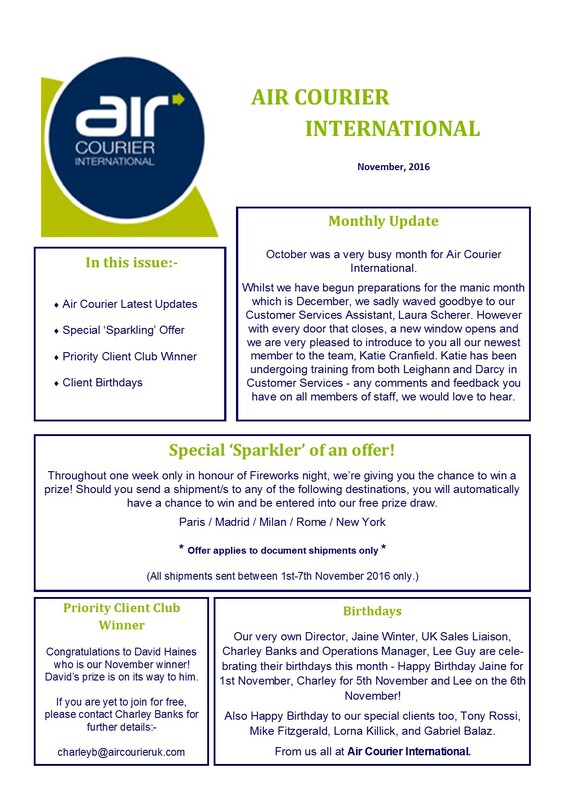 It has come to our attention that the Air Courier International name and brand (along with that of many other courier companies) has been used in a number of online scams in order to solicit money from vulnerable members of the public. 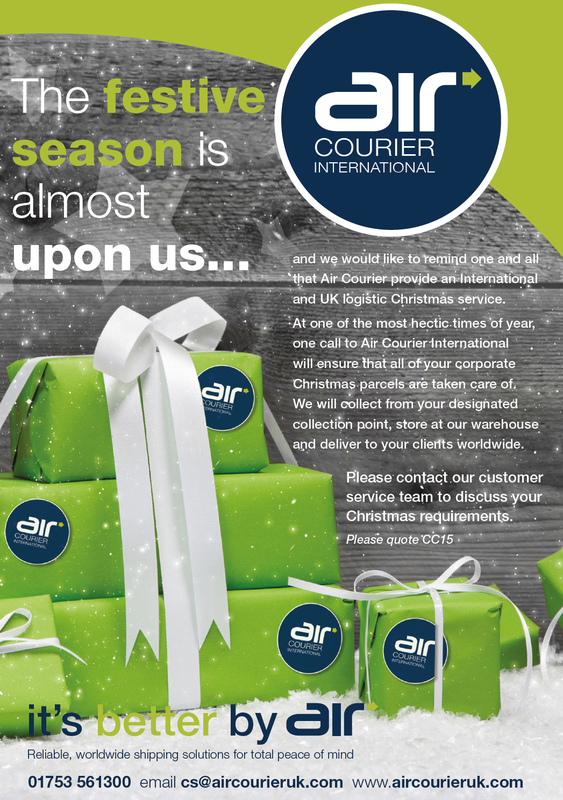 We are appalled at the behaviour of the individuals and groups responsible, and reiterate that they have no connection with Air Courier International Ltd. It is good practice to verify the identity of any person you contact online before parting with sensitive information or money. 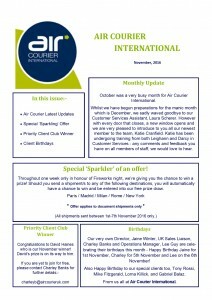 A google search of Air Courier International will show you our official page on the third entry. 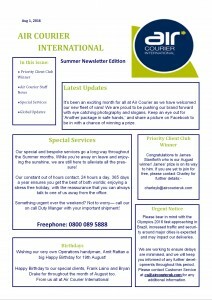 Our homepage of www.aircourieruk.com is the only one that we use, and any emails from any other domain are not from us. We will never ask for money to be sent to us by Western Union or any other untraceable source. In fact, most of the business we conduct is UK based and therefore we are exceptionally unlikely to contact you for payment unless you have had dealings with us already and you are aware of exactly what we are requesting payment for. This bulletin does not affect the obligation of a consignee to pay shipping, duty VAT or similar charges that legitimately incurred and are properly payable at the time of or after delivery. This entry was posted in News on July 27, 2016 by Darren Winter. Please be advised that in the light of today’s attacks on Brussels, deliveries are likely to be delayed significantly. The entire transport system in Brussels has been closed, and access by road to much of the CBD will be restricted and congested. This entry was posted in News on March 22, 2016 by Darren Winter. Please be advised the earlier technical problem has been resolved and all booking services are back to normal. Thank you for your patience and apologies for any inconvenience caused. This entry was posted in News on January 22, 2016 by Darren Winter. Please be advised that due to an issue at one of our hosting centres, our booking system is currently down. This is affecting all client booking pages, as well as our own back office software. 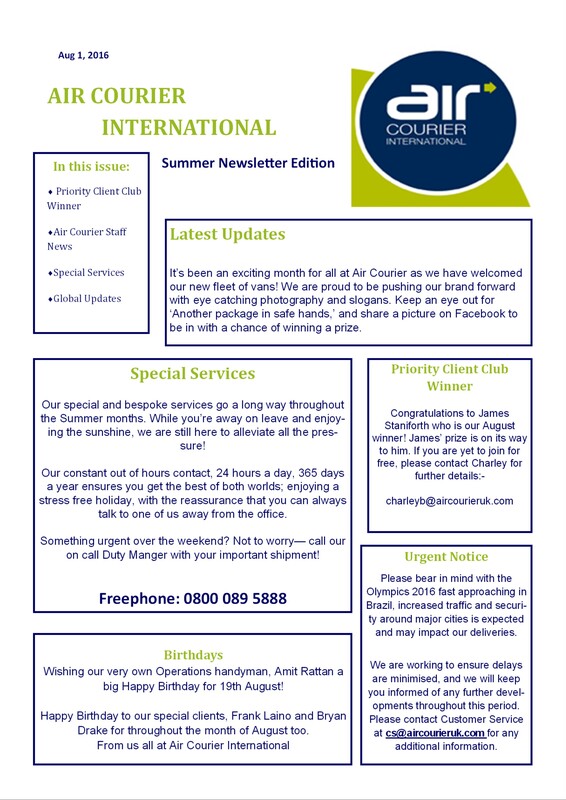 Bookings can be taken manually by email (cs@aircourieruk.com) or verbally over the phone, and we will complete them once our service comes back online. Collections will still be scheduled as normal in the intervening period, and we expect to have our systems back in the next 30 minutes.